Rising investments made in different industries have resulted in increased adoption rate of enzymes in order to carry out industrial processes with ease and in less time. Since the beginning of the 19th century, enzymes are evaluated as biological catalysts that accelerates the rate of reaction. Enzymes do so by lowering the activation energy required to produce products at the end of the reaction. Several important biochemical reactions of the body taking place inside the cells, such as respiration, digestion, metabolism, replication, and post-translational modification, are dependent on enzyme activity. The property of the enzyme to catalyse chemical reaction has enabled its application in a wide range of field. Enzymes play valuable role in various industrial and research applications. Their action is vital in conducting genetic engineering and other molecular biology experiments. With advancement made in enzyme technology, enormous research is taking to develop novel enzymes with advanced functionality. Enzymes are widely used in industries including food & beverage industries, brewing industry, dairy industry, animal feed industry, pharmaceutical, paper & pulp industry, and food processing industry, among others. Several industries are also relying on enzyme to develop environmental-friendly products in order to curb the use of chemicals. Therefore, the ever-increasing demand for enzymes in different industries along with the widespread use of genetic engineering are the primary factors propelling the growth of the global enzymes market. The global enzymes market is segmented based on application of enzymes, such as animal feed, food & beverage, biofuel, cleaning product, research & biotechnology, and diagnostic, among others. The market for research and biotechnology enzymes is further segmented based on products, such as Ligase, DNA Polymerase, Restriction Endonuclease, Reverse Transcriptase, and alkaline phosphatase. The market analysis includes an in-depth examination of the key ecosystem players, key strategies, and developments taking place in this market. Additionally, it includes market dynamics (market drivers, opportunities, and challenges) and industry analysis. Geographically, the market can be segmented into five distinct regions including, North America, Europe, Asia-Pacific, Latin America, and Rest-of-the-World. The purpose of the study is to gain a holistic view of the global enzymes market in terms of various factors influencing it such as key market trends, competitive and regulatory aspects of the market, and scientific innovations with respect to enzyme evolution. The scope of the report is centered upon conducting a detailed study of the solutions allied with enzymes market, which involves wide range of enzyme used in industrial and research & biotechnology applications. The enzyme market is segmented into three different parts: ‘by products’, ‘by application, and ‘by region’. The report offers the reader with an opportunity to unlock comprehensive insights with respect to the market and helps in forming well informed strategic decisions. The research uncovers some of the substantial parameters that must be taken into consideration before entering the market. This research report aims at answering questions related to various aspects of the global market with the help of the key factors driving the market, threats that can possibly inhibit the overall market growth, and the current growth opportunities that are going to shape the future trajectory of the market expansion. The study considers the growth-share matrix model for a comprehensive study of the global enzyme market, and assesses the factors governing the same. Opportunity matrix and detailed product mapping have been included in the report. The market by region has been further sub-segmented in various countries, and in each sub-segment the key market trends, list of the key players, and recent developments, have been discussed. • What are the major market drivers, restraints, and opportunities in the global enzymes market? • What were the market shares of the leading segments, and sub-segments of the global enzymes market in 2017 and what will be their shares in 2026? • How will each segment of the global enzyme market grow during the forecast period, and what will be the revenue generated by each of the segments by the end of 2026? • What are the major regulatory authorities/ associations/ consortiums affecting the global enzymes market and what are the main designations facilitating development and approval of enzyme products? • Which are the companies holding patent rights for enzymes and what patent landscape exist in the market? • Which product segment is expected to register the highest CAGR for the global enzymes market? • How has the market been segmented based on application? Which application area had the largest share in 2017, and the fastest growth rate in the global enzymes market? • Which geographical region will contribute to the highest sales of the enzymes during the forecast period and which will have the highest CAGR? The report also profiles 20 companies including several key players that have been contributing significantly, such as AB Enzyme, Agilent Technologies, Amano Enzyme Inc., Bioline, Biorbyt Ltd., BioVision Inc., DNA Polymerase Technology, Inc., DowDuPont Inc., ENMEX, Enzymatics, F. Hoffmann-La Roche AG, Fapon Biotech Inc., Lucigen, New England Biolabs, Novozyme A/S, Promega Corporation, Sigma Aldrich Corporation, Takara Bio Inc., Thermo Fisher Scientific Inc., and Toyobo. 8.8 DNA Polymerase Technology, Inc.
8.20 Thermo Fisher Scientific Inc.
With advancement of technology, techniques, and methodology, several innovative products are being developed and commercialized by various industries into the market. Enzyme technology is one such method in which tremendous research is going on since the last few decades to ease different industrial processes. Enzymes are defined as the catalysts that help to carry out a chemical reaction. These are protein molecules which enhance the rate of the reaction. They decrease the activation energy required for a reaction to proceed. Enzymes have been extensively employed in food & beverage, animal feed, textile, paper & pulp, biofuel, pharmaceutical, biotechnology, and research industries, among others. The global enzymes market was valued $6.57 billion in 2017 and is anticipated to reach $10.63 billion by 2025. The growing demand for enzymes in various industries is the major reason for the growth of this market. Enzymes have become an integral part of various industrial applications. Other factors supporting the growth of the market include reliability on enzymes for eco-friendly industries and the advancements in the enzyme technology. The purpose of the study is to gain a holistic view of the global enzymes market in terms of various factors influencing it such as key market trends, competitive & regulatory aspects of the market, and scientific innovations into oncology fields. 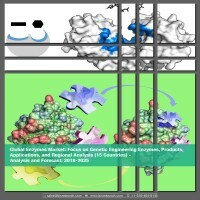 The scope of the report is centered upon conducting a detailed study of the solutions allied with industrial enzyme as well as research and biotechnology enzymes market, involving products used for different applications such as food & beverage industry, genetic engineering, and biofuel industry, among others. The global enzymes market is segmented into three different parts: by products, by application, and by region. The research and biotechnology enzymes are further segmented into different types of products/ enzymes. Based on applications, the market can be sub-segmented into animal feed, food & beverage, cleaning product, research & biotechnology, biofuel, diagnostic, and others. In 2017, food and beverage industry was estimated to be the dominant application segment due to the increased demand for processed and packaged food in developed as well as developing nations. Enzymes are employed in a number of processing procedures in food and beverage industry. However, research and biotechnology industry is expected to register the highest CAGR due to the rising investments and increased regulatory support for this industry. The research and biotechnology enzymes market can be further segmented based on the type of products into polymerases, ligases, nucleases, reverse trancriptases, and others. Nuclease or restriction enzyme was estimated to be the dominant segment in terms of revenue in 2017 while reverse transcriptase segment is expected to grow the fastest during the forecast period from 2018 to 2025. Geographically, the market is segmented into five distinct regions including, North America, Europe, Asia-Pacific, Latin America, and Rest-of-the-World. North America. followed by Europe, is the leading contributor of the market. Within North America, the U.S. contributed to almost 90% of the total share, and the rest of the share was occupied by Canada in 2017. Within Europe, Germany dominated the market in 2017. However, the market for Asia-pacific region is expected to witness high growth rate, during the forecast period from 2018 to 2025, as compared to other regions. The enzymes market especially research and biotechnology enzymes market has a promising potential for growth in the coming years. The report provides an in-depth SWOT analysis of different key players of the market, supported by extensive financial summary of each company. The key players of the market are Novozyme A/G, AB Enzymes, Agilent Technologies, Amano Enzymes, BioLine, DNA Polymerase Technology, Inc., F. Hoffmann La Roche, Enzymatics, Fapon Biotech, Inc., Lucigen, and New England Biolabs, among others.